Alana and Craig Wilson live in a predominately white, middle-class subdivision in Virginia's Fairfax County, just outside of Washington, D.C. Across the Potomac River, Terry and Rodney Jefferson reside in majority-black Prince George's County, Maryland. The Wilsons and Jeffersons are black and middle-class. 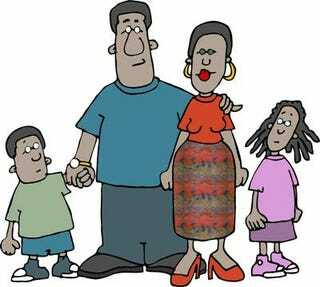 Both families, deeply concerned about the world their children will inherit, do all they can to prepare their kids for the continuing struggle of being black in race-conscious nation. That's all these two families have in common. The pseudonymous Wilsons and Jeffersons are real-life characters in Karyn Lacy's provocative book "Blue Chip Black: Race, Class and Status in the New Black Middle Class." (University of California Press, 2007). Lacy, a sociologist at the University of Michigan, argues that these parents are among the growing numbers of black middle class helping their children navigate the turbulent waters of racial identity as they wade through a mainstream culture that continues to see all-things-white as the norm. Even among educated, upwardly mobile and suburban African-American parents, there is no uniformity of opinion about how best to raise a black child in 21st Century. I didn't have to read Lacy's book to know this. Though my days of heavy lifting as a parent are drawing to a well-earned conclusion (my daughter is a third-year college student and almost emancipated), I have always been fascinated by discussions of how black parents raise their children. Personal experience and pained conversation with other parents assures me that this issue occupies an enormous volume of middle-class black parents' waking hours. My wife and I thought it would be best – and easier – to raise a healthy and happy black daughter, if she was constantly exposed to other middle-class black families. A decade later, we wanted to do the same when we moved to northeast Ohio, but were shocked to discover that Greater Cleveland lacks an upwardly mobile, predominately black middle-class community. So we settled in a largely white suburb with highly regarded schools. It turned out all right, I suppose, but still I wish I'd had another, predominately black and middle-class option. This is an educated guess: Poorer black folks don't worry about such matters. Often confined to hyper-segregated communities and limited mostly to official or servile dealings with white people, they aren't fixated over fitting in with white folks or remaining true to their blackness. Could this be a source of the frisson making intelligent conversation about class-based distinctions among black folks so awkward and uncomfortable? No doubt, for a host of optimistic expectations, middle-class blacks – but rarely the underclass – share the same sense of entitlement to the neighborhoods, schools and workplaces as their white peers. That makes fitting in – and remaining authentically black, whatever that means – a neurotic preoccupation unique among African Americans who are upwardly mobile. Or aspiring to be. "These black parents are most concerned with helping their children negotiate the black-white color line, as opposed to managing relationships with other people of color," Lacy told me in a recent conversation. "They know that when their children grow up, they will spend large chunks of time working, shopping, and perhaps, living in the white world, where mainstream norms and values prevail. But at the same time, they don't want their children to abandon their racial identity in order to fit in there." Pulling it off isn't easy. Some like the Jeffersons in black Prince George's County choose to surround their children with role models of black people who live well because they rise every morning and work hard at downtown jobs alongside white peers. What their children see are black neighbors who live black, but work in white mainstream. By contrast, the Wilsons in Fairfax County opt to live in the "best" – translated, "white" – neighborhoods that their above-average salaries can afford. But they drive into the city or other parts of the region to maintain ties with black churches, social groups and family. As middle-class black parents – and their children – journey back and forth across the color line, how do they keep their footing on either side? The answer lies in the parents' tendency to emphasize meaningful connections to other black people just like themselves, whether they live close by, or miles across the city. As Lacy explained it to me, the black world is composed not only of social spaces and residential spaces – locations defined by a geography of relationships – but also of ideological spaces where black people share black cultural, educational and religious relationships. "A lot of thought and effort goes into nurturing black identities in the suburbs," Lacy said. "As much as middle-class blacks benefited from and value integration, there is also a sense that something special can be lost in the process – the bond with other blacks, the sense of community, and the shared culture that comes with living, working, worshipping, shopping, partying, and going to school with other blacks." If they don't live it, middle-class black parents are willing to spend whatever it costs and go where ever necessary to find it. Ephemeral or real, racial pride is never too expensive nor too far away for us to promise it to our children. Sam Fulwood III is a regular contributor to The Root.